Minimalism wordpress template is just what the name says – a clean and simple, minimalist wp design. There is no header graphic, no footer graphic, etc.. just plain css and text. This wp template supports widgets (don’t forget to enable wp widgets in your admin area under appearance / widgets). 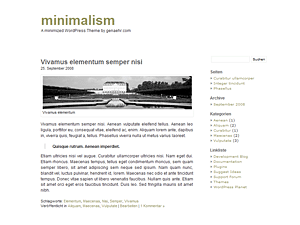 Minimalism is a 2 column wordpress theme with sidebar located on the right side. This theme was designed by Christian Genaehr.